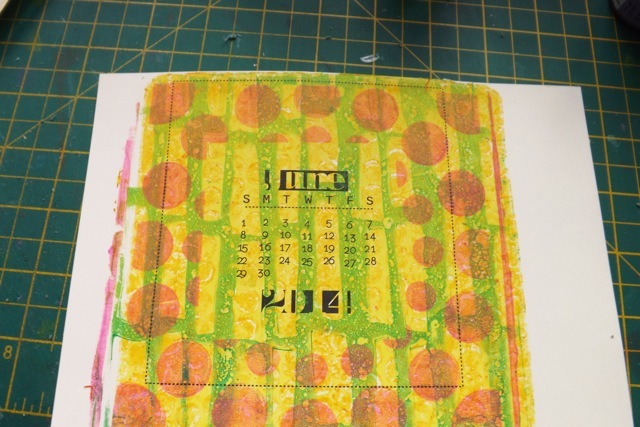 Before I went off on the Word Search tangent, I was planning on making a Gelli print calendar. I finally made the time to play around with the idea. I’ll work on it, now I know what’s what, over the next couple of days and show the completed project when I get done. Here is the process, as well as some options, and pointers to things I think work well and others not so well. The first thing I did was alter a previous calendar printable. MANY of the ones I have made, as well as many you can find with a quick Google search for CD calendar printable will work very well for the. Click the menu item at the top for Calendar Making to see links to most of mine. The PDF of this one is here. The printed calendar part is sized so it can be covered perfectly with a standard Post-It note. 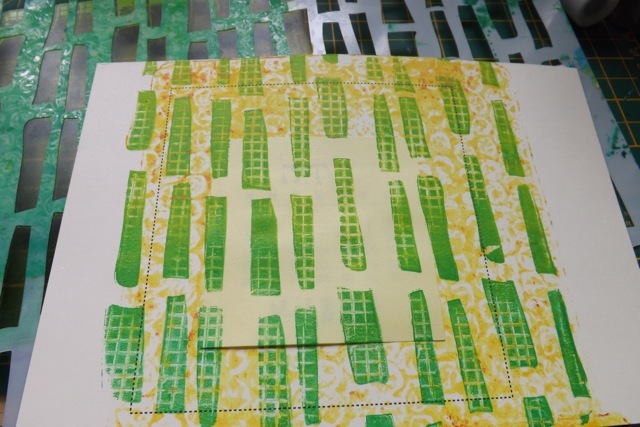 Keep in mind that although I am playing with Gelli prints, the same idea can easily be used with many stamping techniques, using inks or sprays to colour the background instead. 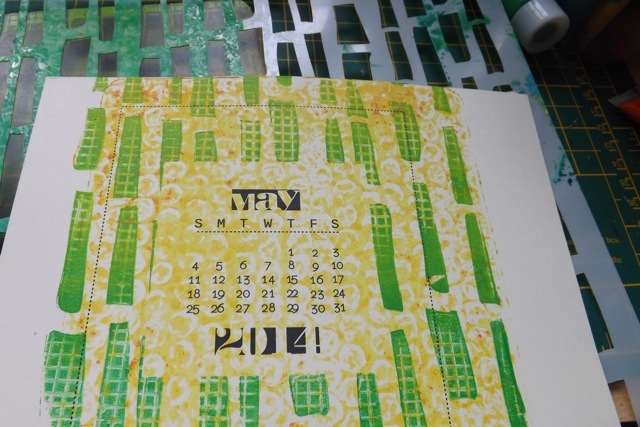 For this version, first print all the calendar sheets and cut them in half, one month per 1/2 sheet. Add a Post-It not over the area you want to remain un-printed. Pull the print. I played with light-first, darker-over combos, but really any sort of print, so long as the text area is masked, should work without compromising the readability. The masked are will remain plain cardstock, and I like this for how clear and readable the information is. Pull prints on an A4 (US letter should work as well) piece of cardstock. Think READABILITY and pick a fairly light colour and an overall pattern. I find bubble wrap my favourite for this. I tried a light yellow and pulled the first full-strength print as well as the ghost print for an even lighter version. I have only the 6 inch plate which is perfect to get two more or less equal sized prints to a sheet. 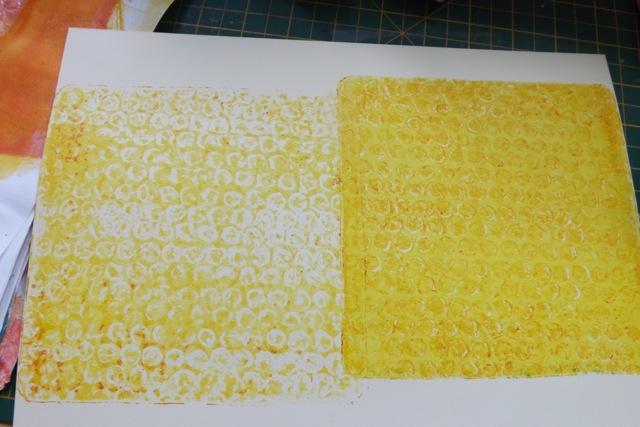 If you have a larger plate, I would maybe mask 1/2 the sheet and pull your first one, then mask that and pull the other, rather than pulling a full-page, unless you have a plan for the unused half. But you can do as you like, of course! I’ve proved in past projects that printing on a pulled print works perfectly well, at least with my Canon printer. Test your own inks and see to be sure, before you do a load of them and find it smears. Print the calendar sheet onto the pulled print. I think both the light and dark versions are clear, although the light is maybe slightly more so. Now mask the text area then pull your print to get more colour and pattern. I ALSO pulled a print without masking. I think you will agree that is not very readable – or maybe you like that better, Again, up to you. They will fit a standard CD case for using as a desk calendar, but that is just one thing you could do. 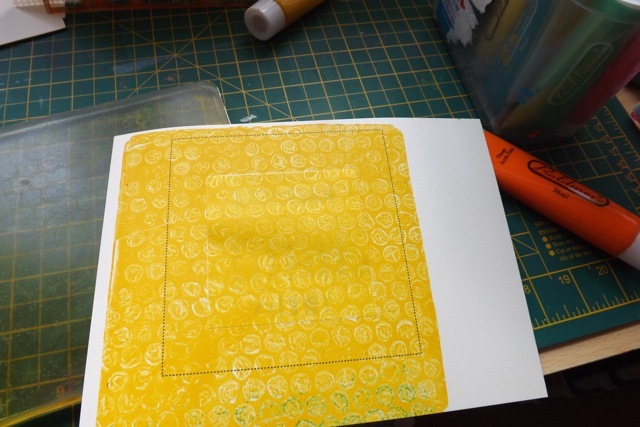 You can print the PDF four images per page to get quite a small print, if you wanted to pull a print over the whole page – that will give you pages that are about 2 1/2 inches, but the Gelli Print part around the edges will be pretty small, less than 1/2 inch around the text. 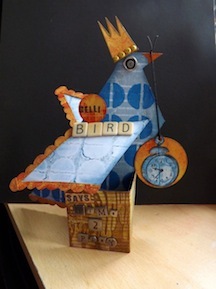 Personally I’m not sure that is worth doing, not for a Gelli print. 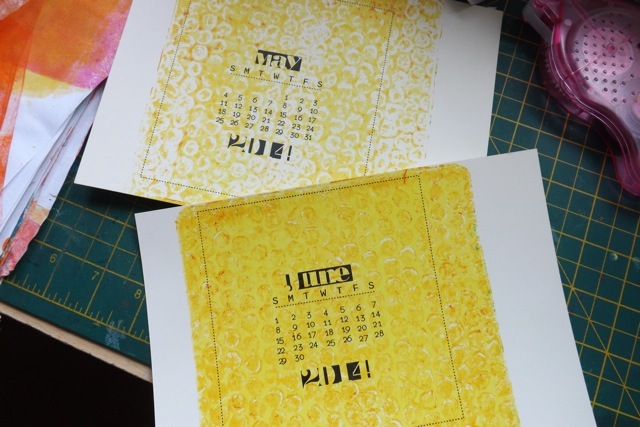 But if you wanted to make plain tear-off calendars that would be the way to do it. 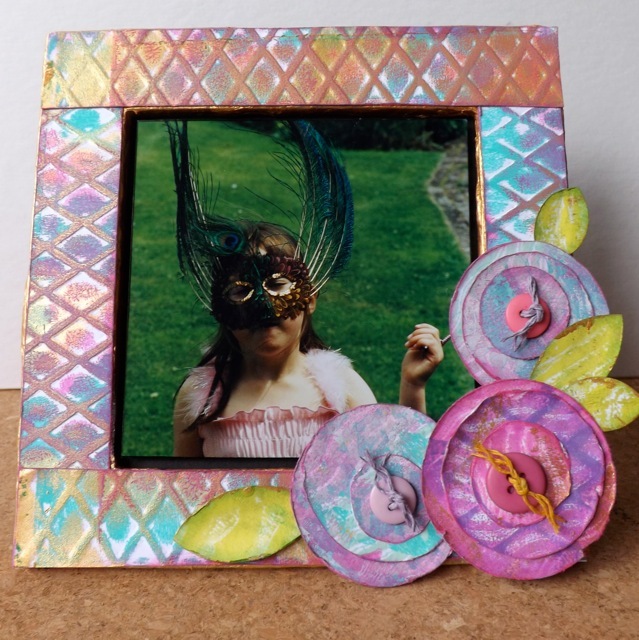 I think making a frame for the CD case, like I did with some Gelli debris here, would be nice. Just make the opening as wide as you can to show off the prints on the pages. Now I know the method, I just have to complete the rest of the pages. 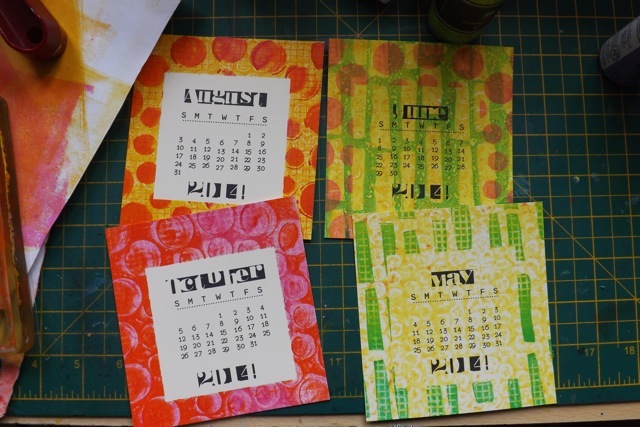 One last idea – You can always print the calendar pages then cut them out and mount them onto a Gelli print and use up some of your prints that way. That is by far the easiest and most predictable way to get something you know you will like. 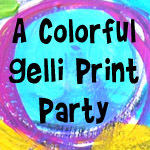 But isn’t part of the fun of the Gelli plate the whole surprise/random aspect of pulling prints? 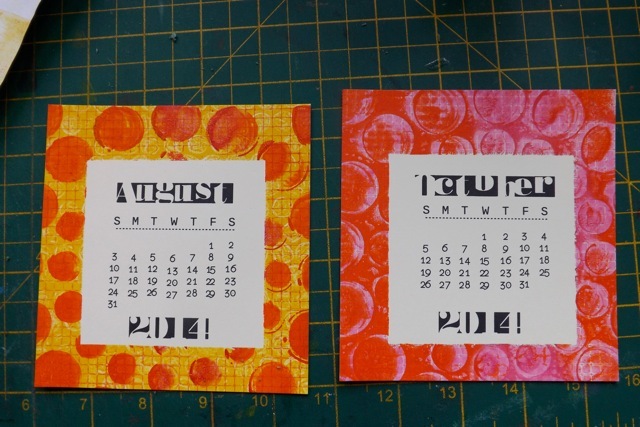 I’m keen to experiment with the circle calendar myself, or masking the text with a circle rather than a square….. 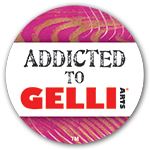 Categories: art, calendars, Gelli plate monoprints, printables, tutorial | Tags: calendars, Gelli plate, Gelli Print, how-to, printables | Permalink.